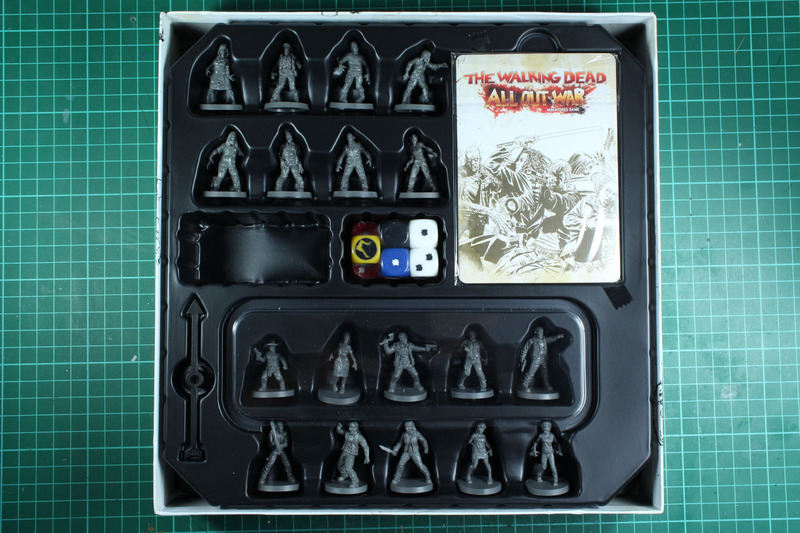 With the mid-season break on the TV series by AMC, it is time for some The Walking Dead, but this time as a miniatures boardgame by Mantic Games. 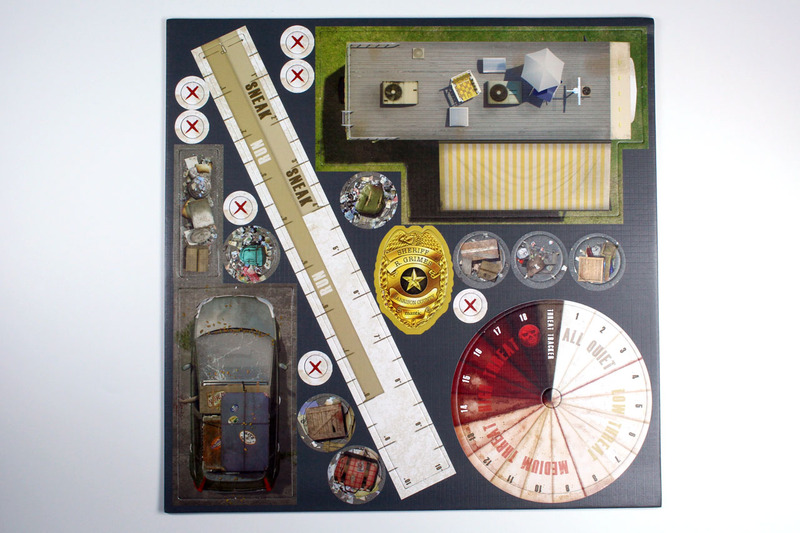 And with all the Kickstarter pledges arriving, I want to show you, what the regular box looks like. 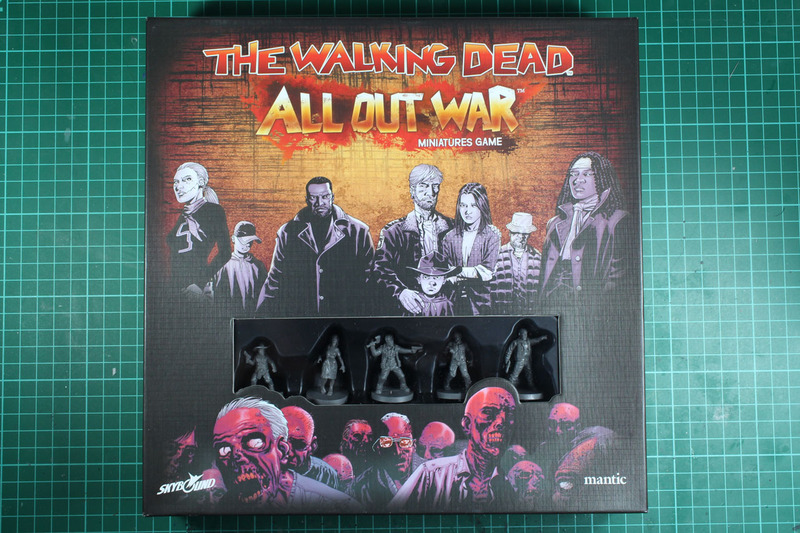 For 34,99 GBP you get The Walking Dead - All Out War box set, with 18 miniatures and all the dice, tokens etc. you need to get started. Before we get started, please keep in mind, Mantic acquired the license of the comic and not the TV series. Some details are different, some characters went different ways and some, like Daryl, don't exist. There is a vacuum formed tray, that will keep your miniatures in place, along with inserts for the cards, dice and a few of the tokens. 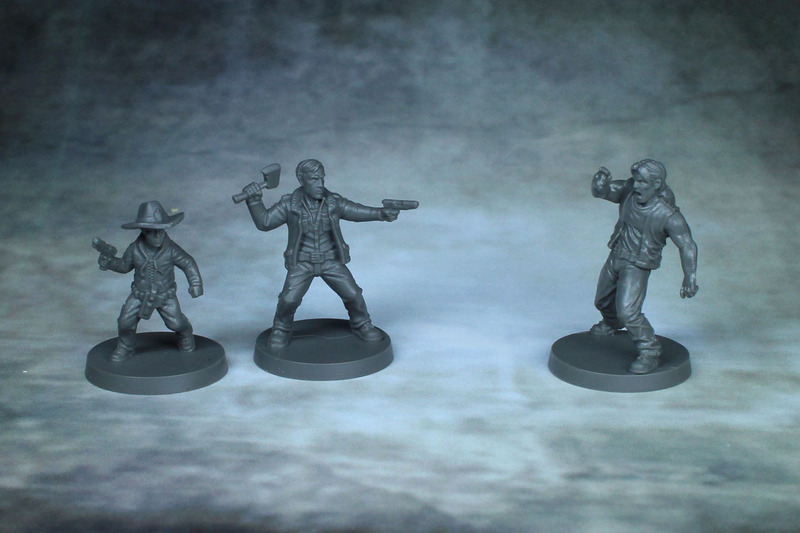 Within the starter set you get the father and son duo of Rick and Carl Grimes, along with 4 Scavengers, their leader Derek and three others, that now have names, but didn't in the comic, Patrick, Liam and Sandra. 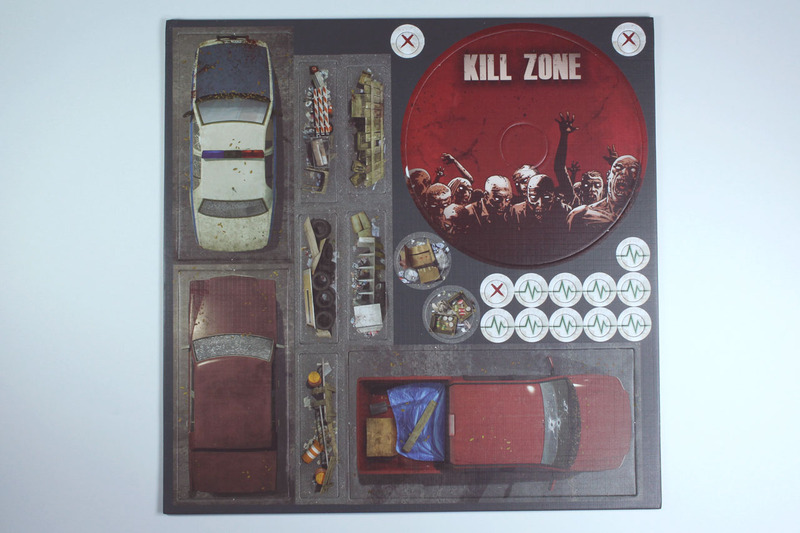 Below the tray you'll find a shrink wrapped package, with two heavy card board sheets, the foldable gaming map / poster (4 times the size of the box) and the rules. The card board is produced in a good quality, the punching is thorough. For newcomers to board games, when it comes to handling card board markers / token or gaming parts in general. If you're going for often to heavy use, seal the edges with a bit of PVA, it makes the card board more stable and protects them from fraying. 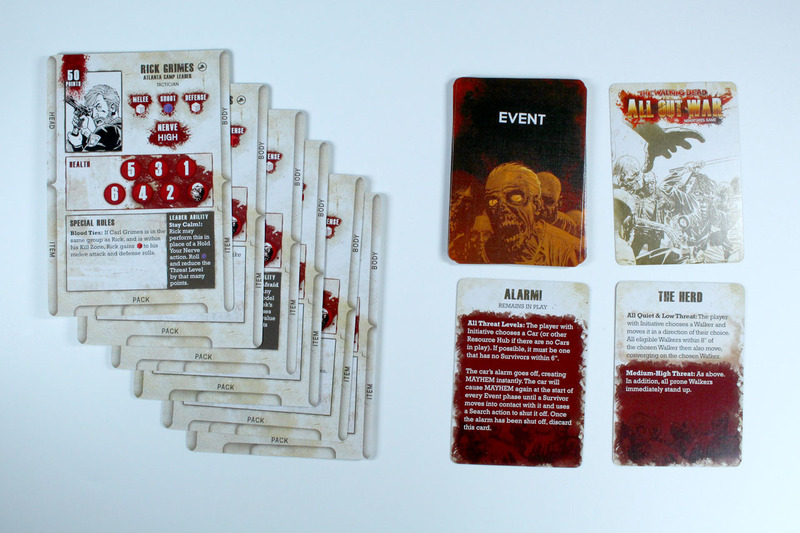 There are three different card sizes, covering equipment and gear (small), events (medium) and the characters (large). 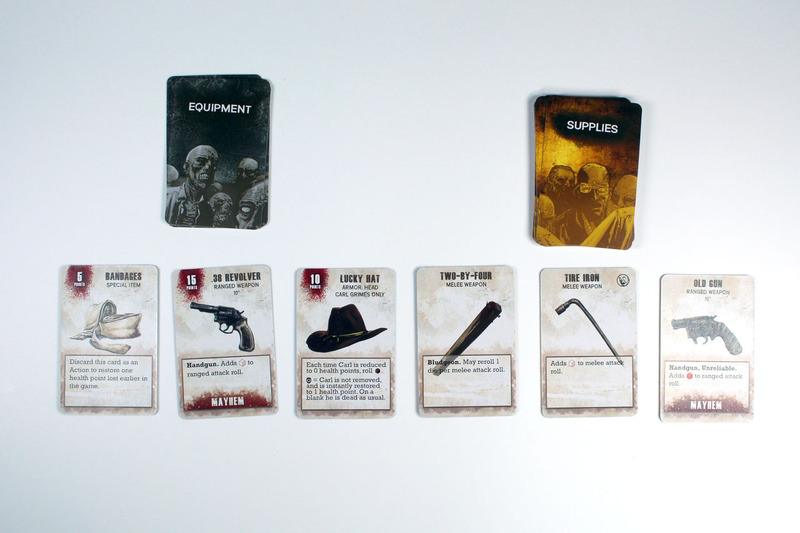 The 6 character cards belong to the characters mentioned above. 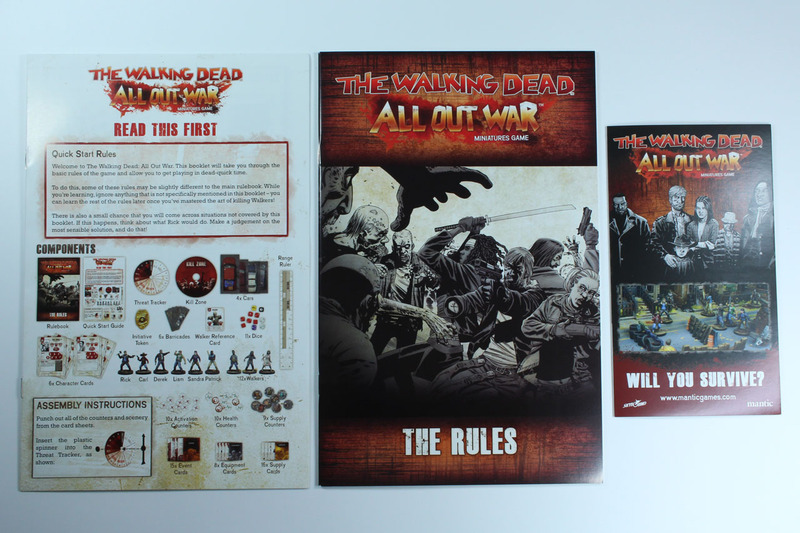 There are two books and a leaflet included, covering quick starter rules, the regular rule sets and a brochure on the merchandise, mantic points and the continued range of the game. The miniatures themselfs are at the top end of the 32mm scale, a bit overdrawn but capture the look of the comic in a great way. 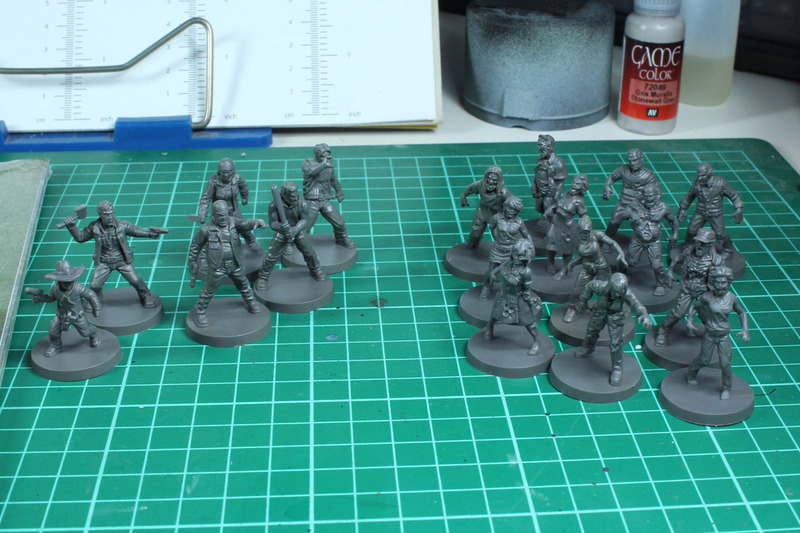 For scale comparison you see the TWD miniatures next to a Studio Miniatures, Crooked Dice and again Studio Miniatures. 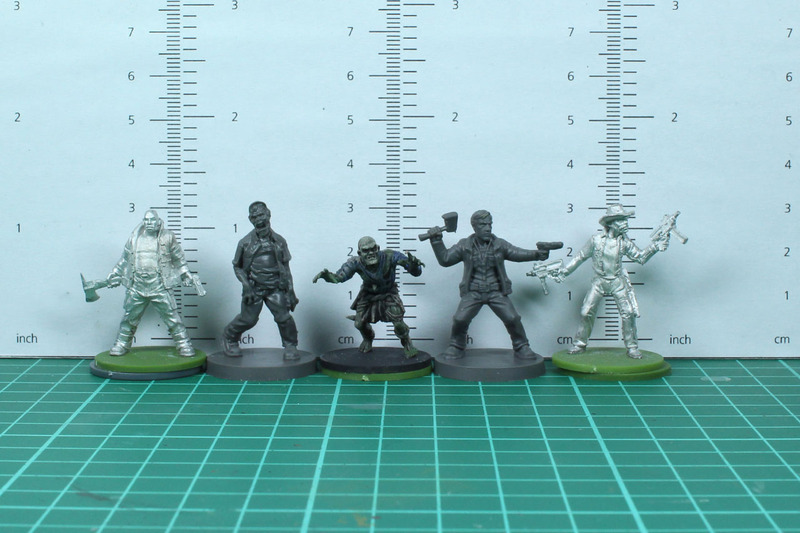 In the third they are next to Hasslefree Miniatures, a Kings of War Mantic Zombie and a Reaper miniature. 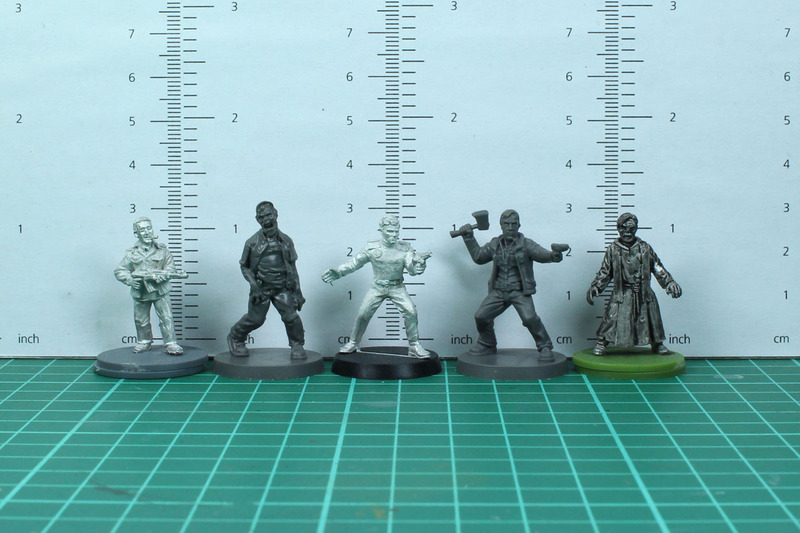 For a board game the miniatures are incredibly well done. Yes, they have mold lines, but those are pretty easy to clean. There is no assembly, only a bit of fixing warped weapons (the baseball bat and knife were a bit off). 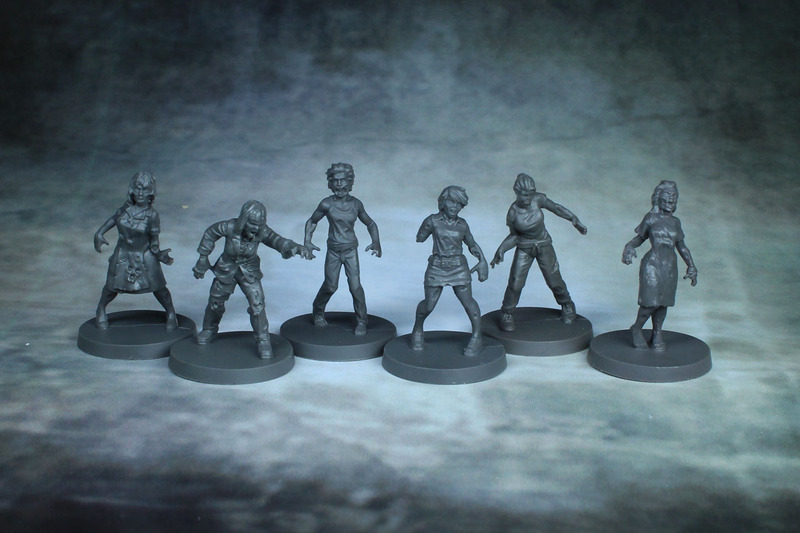 In addition to the 6 survivors, there are 12 zombies, two sets of 6 female and male. A plus is definitely the fact, that there are no doubles in here. I already had the chance to try out the game at Burg Stahleck in May. It plays very smooth and fluent, especially small rounds with only 2-3 characters on each side can be played very quickly. 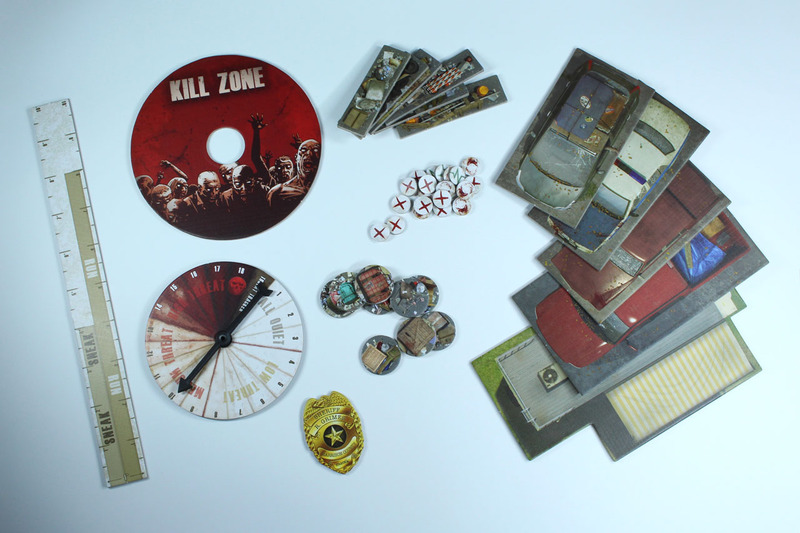 The game is dark, fast and very bloody, but that is never a bad gaming experience in this context, as we are talking about the zombie apocalypse and The Walking Dead, where people die. 35 GBP is a reasonable price for a board game. 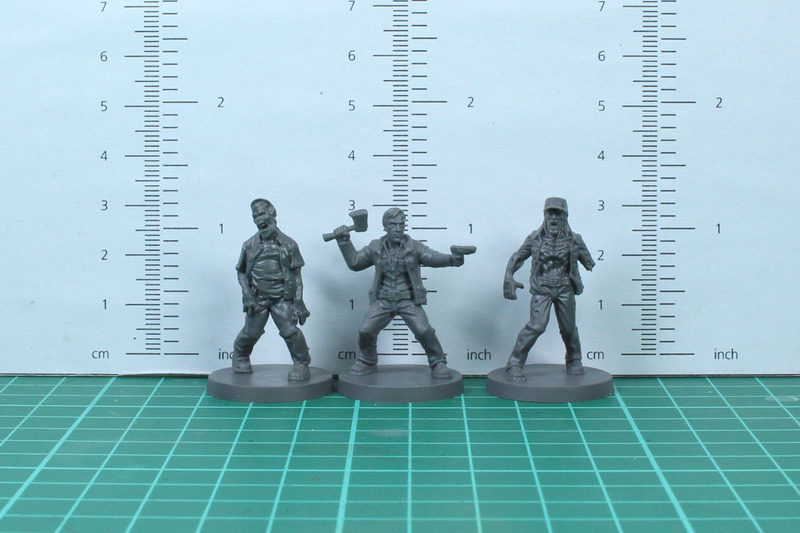 The quality of the gaming material is solid and the miniatures are incredibly. 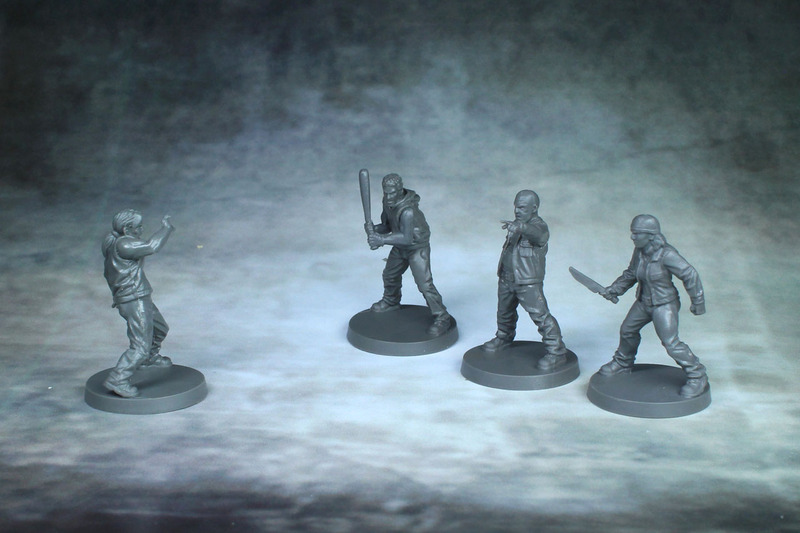 Mantic did Mars Attacks already in a good way, Fantasy Flight does a good job on their Imperial Assault range, but this Walking Dead range has a quality beyond that, in casting as well as sculpting. 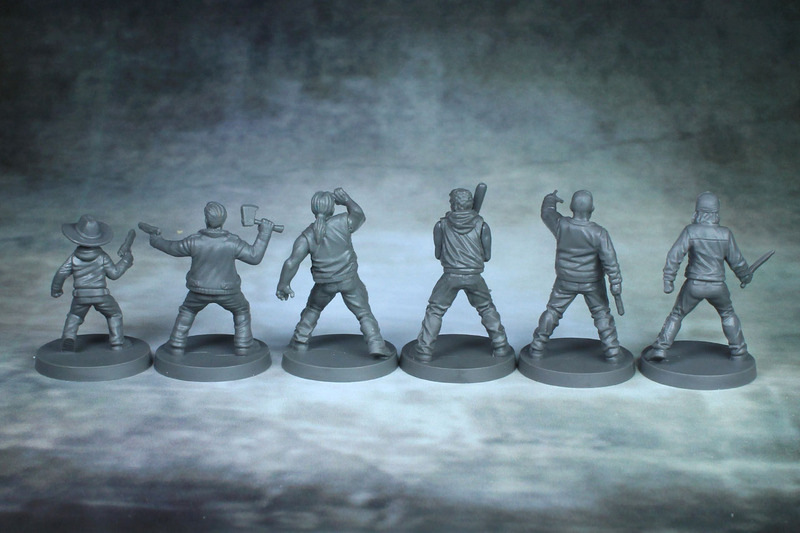 There are already two expansions available, Days Gone By, giving you rules for your own characters (in my eyes a must have, to bring in all these lovely miniatures and characters from pop culture) and The Prelude to Woodbury, with its rules for solo playing. 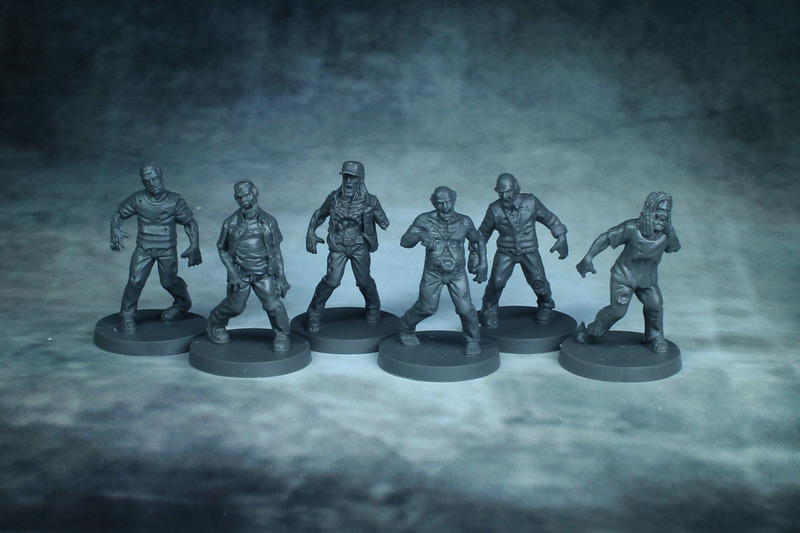 Both sets add more characters to your TWD collection, and more individual zombies (still no doubles! ), which is a great asset. 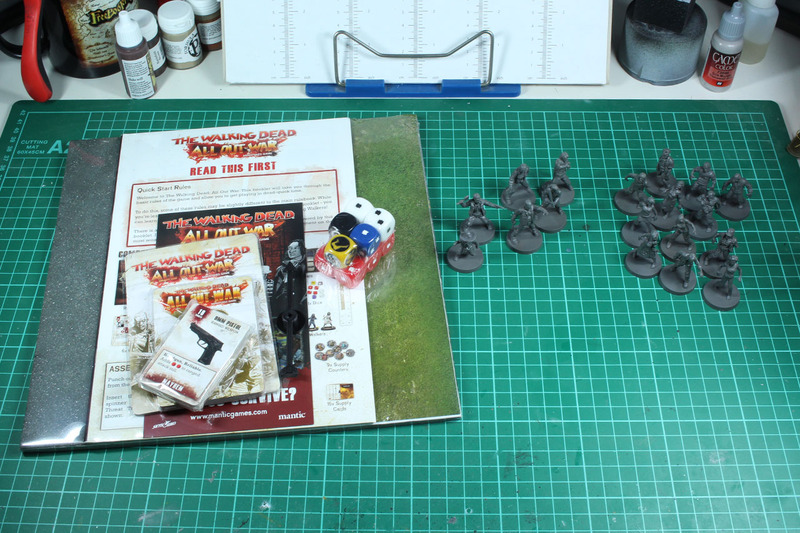 This is a convincing product, very close to the comic and might be a serious danger to your hobby budget, as the expansions and boosters are addictive.